The November Man returns former James Bond Pierce Brosnan to the bloody world of cinematic spy games. Indeed, the filmmakers seem to proceed with the mandate that the November Man does whatever 007 can't. Unlike his world famous former alter ego, Brosnan's so-called "November Man" Peter Deveraux works for the CIA, trains young agents, and has managed to keep a secret family hidden from his superiors at Langley. Older, greyer, wearier, and with a bit of a paunch, Brosnan still effortlessly exhibits lethal cool. With an international cast set in modern day Serbia, The November Man sees Brosnan caught in an unwieldy murder-conspiracy involving a Russian politician and the war crimes he committed in Chechnya in 1999. Brosnan, his bitter former protege Luke Bracey, their CIA superiors, and a hook-nosed Russian assassin Amila Terzimehic are all hot on the trail of gorgeous Olga Kurylenko, a social worker with ties to the war crimes the Russians committed in Chechnya. Herself a former Bond Girl for Daniel Craig in Quantum of Solace, everybody wants Kurlyenko's body, as the labyrinthine plot slowly reveals her involvement in what is literally a new world order at stake. 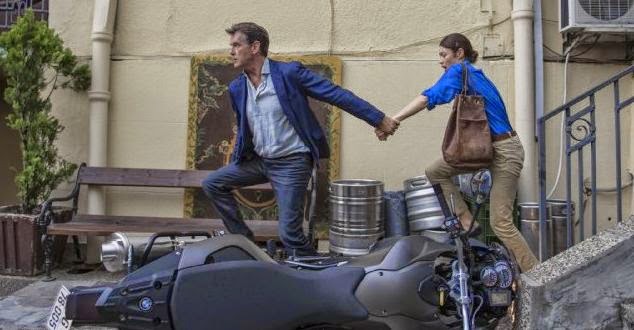 As he protects Kurylenko from international killers, Brosnan seems to relish unleashing the kind of ruthlessness Daniel Craig has been lauded for infusing into 007; never more so than when Brosnan holds Bracey's girlfriend Eliza Taylor hostage at knife point to even up a score with Bracey. Gruff, bloody, and a little bleak, The November Man is overall a fine return to form for Brosnan. We're told Brosnan was named "The November Man" because of the body count he leaves behind; it's an apt name.